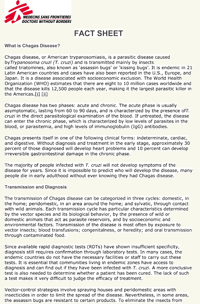 Chagas disease has two phases: acute and chronic. The acute phase is usually asymptomatic, lasting from 60 to 90 days, and is characterized by the presence of T. cruzi in the direct parasitological examination of the blood. If untreated, the disease can enter the chronic phase, which is characterized by low levels of parasites in the blood, or parasitemia, and high levels of immunoglobulin (IgG) antibodies. Chagas presents itself in one of the following clinical forms: indeterminate, cardiac, and digestive. Without diagnosis and treatment in the early stage, approximately 30 percent of those diagnosed will develop heart problems and 10 percent can develop irreversible gastrointestinal damage. The majority of people infected with T. cruzi will not develop symptoms of the disease for years. Since it is impossible to predict who will develop the disease, many people die in early adulthood without ever knowing they had Chagas disease. There are three categories for the transmission of Chagas disease: domestic, in the home; peridomestic, in an area around the home; and sylvatic, through contact with wild animals. Each transmission cycle has particular characteristics determined by the vector species and its biological behavior, by the presence of wild or domestic animals that act as parasite reservoirs, and by socioeconomic and environmental factors. Transmission of the disease is most often by exposure to vector insects; blood transfusions; congenital, or heredity, transmission; and oral transmission through contaminated food. Since available rapid diagnostic tests (RDTs) have shown insufficient specificity, diagnosis still requires confirmation through laboratory tests. In many cases, the endemic countries do not have the necessary facilities or staff to carry out these tests. It is essential that communities living in endemic zones have access to diagnosis and can find out if they have been infected with T. cruzi. A more conclusive test is also needed to determine whether a patient has been cured. The lack of such a test makes it very difficult to judge the efficacy of treatment. Vector-control strategies involve spraying houses and peridomestic areas with insecticides in order to limit the spread of the disease. Nevertheless, in some areas, the assassin bugs are resistant to certain products. To eliminate the insects from houses, spraying must be continuous and housing must be improved. It is important to conduct vector-control activities in addition to treating patients to avoid re-infection and increased parasite load. Greater effort also must be made to ensure the quality of blood banks in order to avoid contamination from transfusions. There are currently only two medicines to treat Chagas disease—benznidazol and nifurtimox. The first, benznidazol, has only one supplier, and the supplier’s current inability to increase production has led to dangerous drug shortages. The second drug, nifurtimox, is used only when first-line of treatment fails, since it causes patients to experience more side-effects. Both drugs were developed over 40 years ago during investigations not specifically aimed at Chagas disease. Presently, neither drug is adapted for pediatric use or for use by pregnant women. And while the success rates reach almost 100 percent in acute cases, people with chronic cases have to be treated under medical supervision. Treatment tends to be less effective for chronic patients, and they can suffer from multiple side effects. However, recent studies demonstrate that it is feasible and worthwhile to treat patients in the chronic phase, even after the heart is mildly affected. Side effects from treatment are more common in older patients and doctors have been reluctant to administer the medicine out of fear of the consequences. It has been shown, however, that the adverse effects are manageable with regular medical follow-ups, and there have been no deaths caused by treatment in these projects. Doctors Without Borders/Médecins Sans Frontières (MSF) has used different operational models to provide free diagnosis and treatment for Chagas disease since 1999 in countries including Honduras, Nicaragua, Guatemala, Colombia, and most recently in Paraguay. MSF also currently runs projects in Bolivia—which has the world's highest prevalence of Chagas—just across the border from Paraguay and Colombia. Between 1999 and September 2011, MSF tested more than 80,000 people for Chagas and treated more than 4,200 patients. This shows that although current resources are not ideal, the diagnosis and treatment of Chagas disease is viable in remote areas and other environments with limited resources. With the limited resources currently available to treat Chagas disease, medical teams have to deal with many shortfalls and at times don't have any treatment options. Millions of people suffering from Chagas disease, especially in rural areas, have neither the opportunity to find out that they are infected, nor the possibility of being treated. Secured production of benznidazol, new diagnostic tests, better medicines, and a test to determine whether a patient has been cured are urgently needed to provide wider access to quality diagnosis and treatment for this disease. Inclusion of diagnosis and treatment of Chagas disease as part of any disease control strategy: This is in addition to the current focus on vector control by governments of endemic countries, funders, and the Pan American Health Organization (PAHO) and World Health Organization (WHO). Systematic testing and diagnosis of Chagas disease at the primary care level in endemic areas and parts of the world with population movements from endemic areas: The lack of resources at the primary health care level limits proactive and integrated approaches. Increased access to treatment for children and adults in the primary care system: Millions of people, especially in rural areas, have neither the opportunity to find out that they are infected nor the possibility of being treated. Integration of vector control with treatment of patients: Ineffective prevention efforts cause the insect and the disease to reappear and patients to become newly infected or reinfected. Improved estimates of the burden of disease: The burden of Chagas disease is significantly underestimated in official statistics. Inadequate systems for surveillance and reporting of this disease translate into severe underreporting of new Chagas cases in endemic and non-endemic regions, leading to a lack in demand forecasting data for the medicines. Evaluation, validation and dissemination of currently available rapid diagnostic tests (RDTs): The diagnostic accuracy of RDTs already available in the market should be evaluated and validated. Simple and affordable diagnostic tools are required to make diagnosis of patients in the field accessible. New diagnostics urgently needed: A test for cure is urgently required to be able to confirm success of treatment for the patient and is essential in measuring efficacy for new drugs. This requires long-term investment and commitment from laboratories, investigators, and funders. New treatments urgently needed: Current treatments consist of two medicines developed more than 40 years ago that have limited efficacy in the chronic phase and a significant risk of severe adverse-events. Pediatric formulations of current treatments and new drugs with improved efficacy and safety profiles are urgently needed. Increased and sustainable public funding for treatment: Treatment of both children and adults has recently been shown beneficial. It is now time to scale up treatment programs.